This weekend’s Ironman race took place in Nice. Ironman France is a long standing member of the European Ironman calendar. It’s a big race attracting over 2,500 entrants and offering the now standard 40 Ironman World Championship slots. As with most European races, the competition is stiff. The course itself involves a sea swim, climbing and descending on the bike and a hot, flat run. 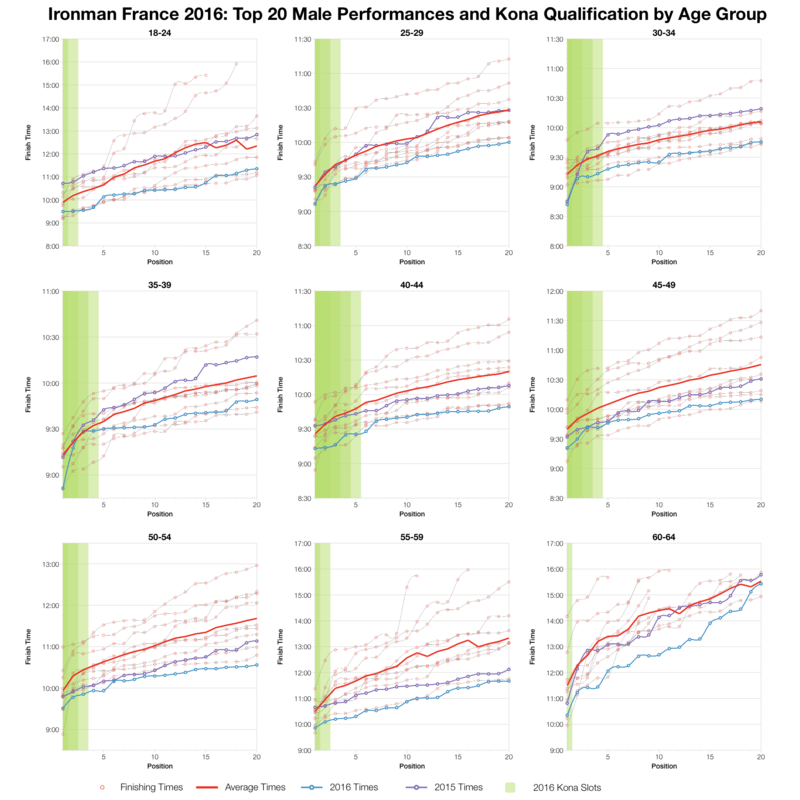 A brief note on this analysis – I still haven’t collected 2010 results into my database so times from that event are excluded from all the charts shown here. The data appears to be available, it’s something I need to rectify before the 2017 race. 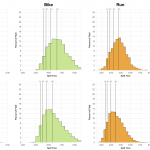 Comparing the distribution of finishers at this year’s race one thing jumps out: how much faster the run was. There’s a big difference between this year’s results and the aggregated results form the last decade; roughly 15 minutes at the median point. For whatever reason – perhaps conditions were good for running – the bulk of the field was faster than normal. 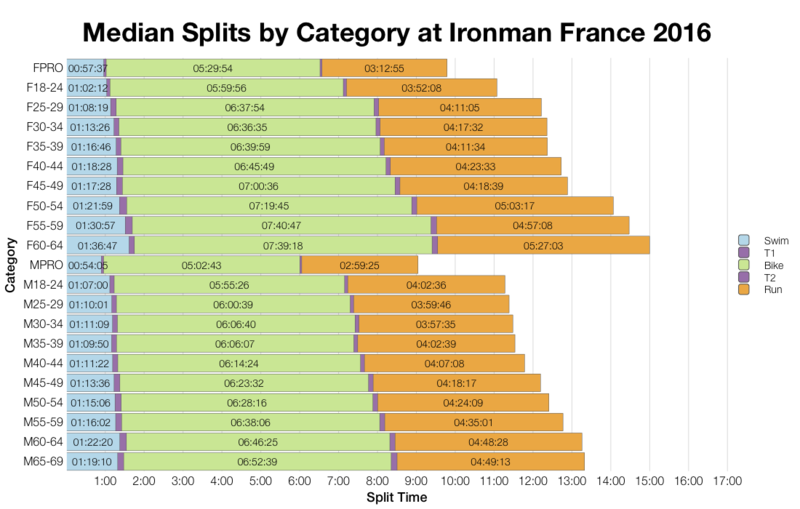 This positive shift in the run has a knock on effect on the overall splits, making this years race a fast year in Nice. DNF and DNS data from this year’s race look to be inline with course norms. There’s not much more to add, figures are very much the average for this course. If conditions were better they can’t have been that much better as I’d expect to see a drop in rates in that instance. 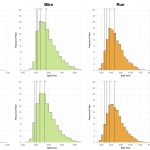 Separate age group medians naturally show a similar trend to the overall distribution. 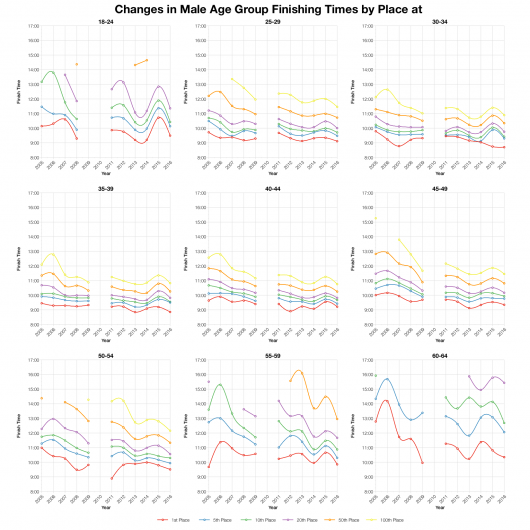 Run times are down across the majority of age divisions at this year’s race. 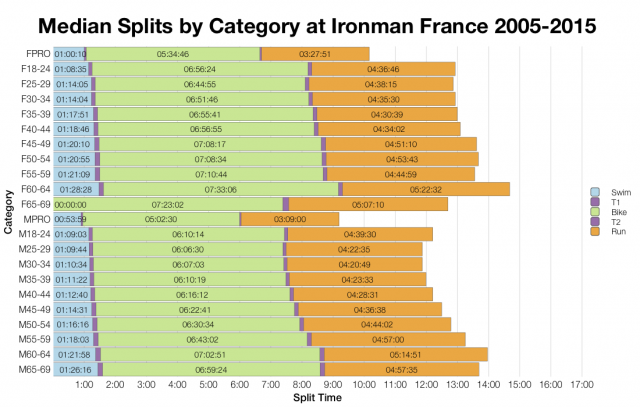 Bike and swim times are more variable, some are faster, but the margins are smaller. Checking the top ten nationalities we see a more diverse mix than recent races. Half the athletes came from France, the rest were widely distributed over Europe and the rest of the world. 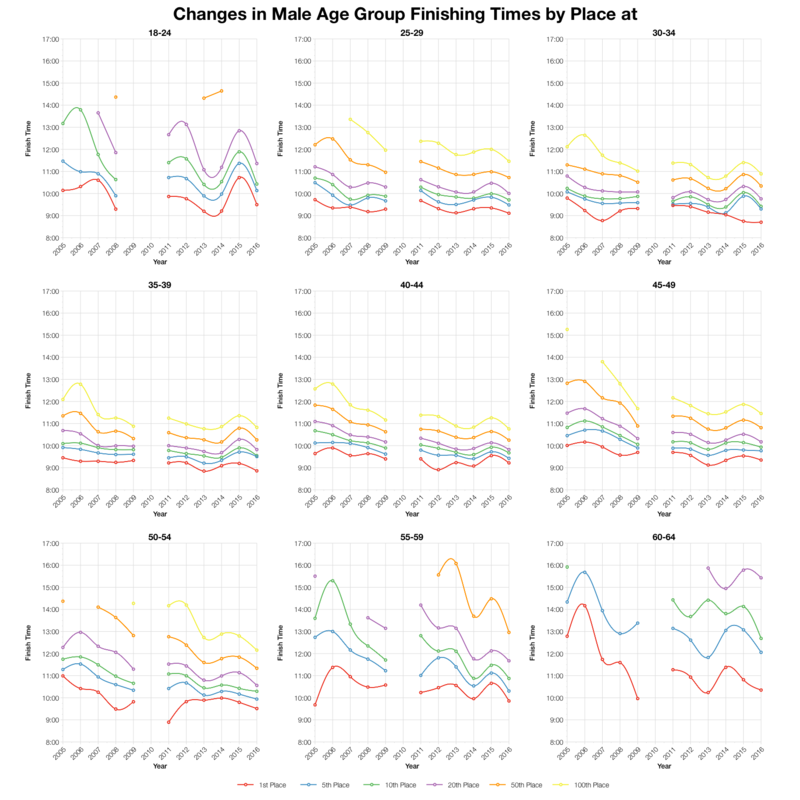 If we track the times for specific finishing positions over the last decade we can see that, while this year’s race looks to be an upturn on last year’s it’s not necessarily the fastest for Nice. This highlights an issue with using aggregated data – a number of slower (or in some cases faster) years can heavily influence the distributions. I might achieve better results by limiting my analysis to the last 5 years of data. The table above gives my estimates of Kona slot allocations based on the number of athletes in the tracker, actual numbers will depend on who started the race. Using these numbers I’ve given qualification statistics assuming that no roll downs take place. These are the times you’d likely require to qualify at this year’s race. From the perspective of age group Kona qualification it was definitely one of the faster year’s in France. 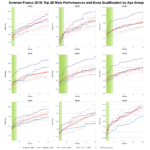 There is a very consistent trend to faster than average times across the age groups. 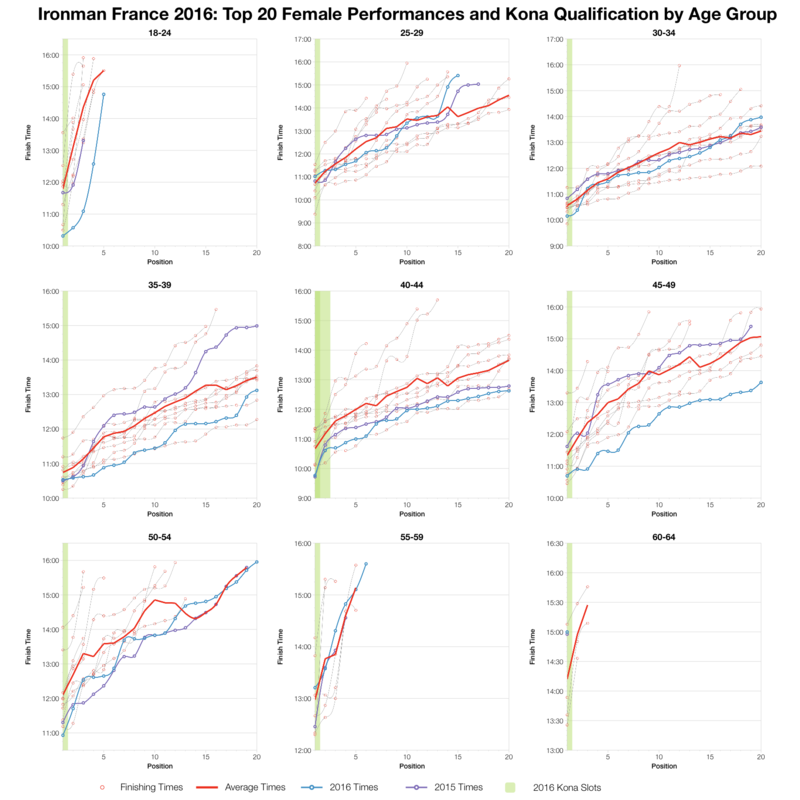 The drop off rate from first through fifth, tenth and back to twentieth looks consistent though, suggesting the race was as competitive as ever, but conditions helped the top age groupers finish sooner. So overall this was one of the faster years in France. Qualification times were faster than average for the event and finishing times in general followed that trend. There have been other comparable years, 2014 looks to be similar for example. 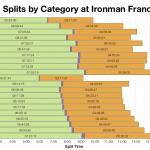 You can access a spreadsheet of the full results and splits from Ironman France 2016 on my Google Drive.